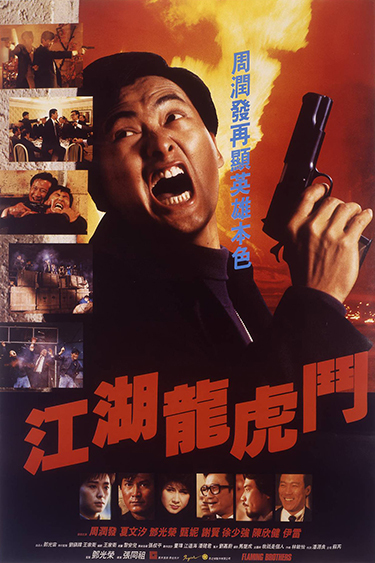 Riding on the success of John Woo’s A Better Tomorrow, and the growing interest in the “gun-fu” action genre, Joseph Cheung directs Flaming Brothers, a gripping action thriller about brotherhood. Life long friends Tien (Chow Yun Fat) and Alan (Alan Tang) have made a decision from an early age to survive on the streets any way they can. Twenty years on, the pair are established gangsters who own a nightclub and run guns for the corrupt Triad boss Mr. Kao (Yin Tse). Their friendship is threatened when Tien decides to quit his life of crime to settle down with the girl he loves, Ka-Hsi (Pat Ha). Going their separate ways, Alan continues his dangerous life in the Triads. However, when Alan finds that his life is under threat when a rival gang tries to take over, brotherhood prevails as the two set out to take the new gang down.